In early 2018 we installed a mural, "Through the Windows" in place of the decaying boards in the window frames of Cross House, in Tolsey Lane. This proved an instant hit with local people and considerably brightened up the lane. New tenants have moved into Cross House recently and are converting the former shop into a micro-pub. They wish to restore the windows , so the mural has been taken down and placed in store. We are looking for a new place to hang "Through the Windows", in or near the alleys. If you have an suggestions then please get in touch. All that remains on the once notorious Bank Alley is a short stub running through the "Out of the Hat" building on Church St, which houses the Tourist Information Centre. Alleycat has proposed using the otherwise empty alley as a "Alley interpretation centre", which would tell the story of the alleys using interactive touch screen wall displays. We had applied for - and had been validated for - an EU grant as a tourist/heritage attraction. Unfortunately, the scheme has had to be abandoned as the owners of the alley - Tewkesbury Borough Council, which supported the scheme in principle, did not want to commit to a five year lease of the alley. Project Alleycat are very disappointed that this scheme cannot proceed, it would be an exciting development for Tewkesbury. We are actively looking for an alternative venue, but would also need to find an alternative source of funding as EU grants will cease with Brexit. The Cheshire Cat has been successfully assembled and mounted in its new home in Warders Alley. To record the effort that went into making and displaying the Cat, we had a small glass plaque made. 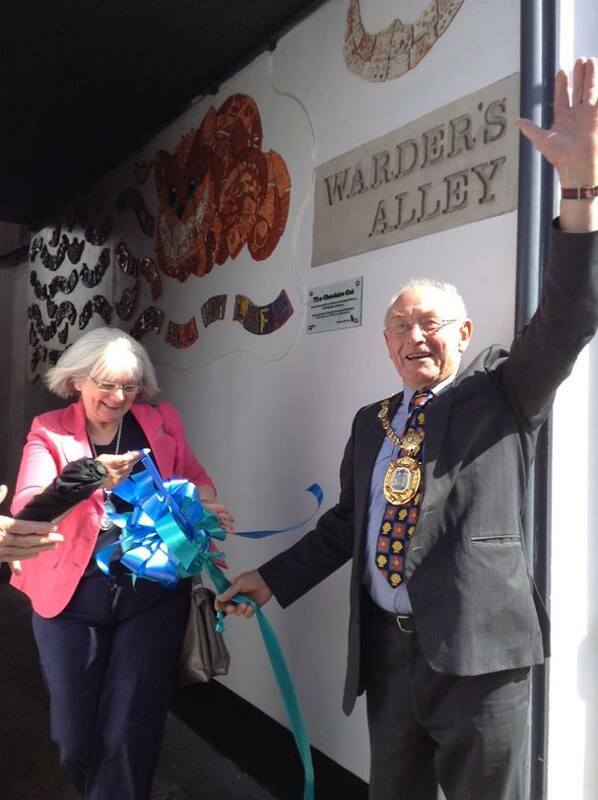 This was officially unveiled by Borough Mayor Harry Turbeyfield and Deputy Town Mayor Christine Danter. Project Alleycat invite you to join us in cleaning and weeding the alleys. 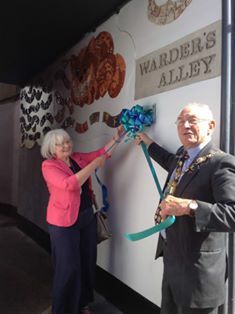 Alleycats have partnered with Leonard Cheshire Disability to work with local schools and youth groups to create and install an artwork in Warders Alley, with the kind permission of owners M&Co. Warders was rebuilt in the 1970s and is a very bleak concrete tunnel, so definitely in need of livening up. We have also been in touch with the County Council to see if we they can improve the drainage (there is a near permanent puddle) and install street lighting - there is none at all! 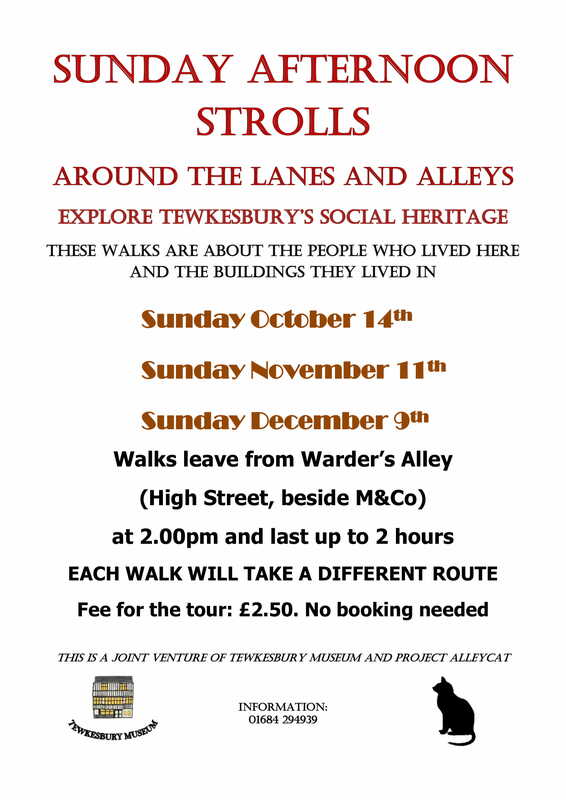 Tewkesbury Direct magazine will be carrying a monthly article on alleys. December's explains the difference between courts and alleys, January's will tell the story of Bank Alley.